Shrimp Ravioli with Tarragon Cream Sauce | "Il faut goûter"
It feels a little fancy. I just learned that wonton wrappers make an excellent start to homemade ravioli. They’re thin and a bit slippery after boiling–for some reason this makes them feel decadent. This shrimp filling is really nice, but if seafood’s not your thing, try a chicken or cheese and vegetable filling. Whatever you do, make this Tarragon Cream Sauce! This is one of the yummiest sauces I’ve had on pasta in quite a while, and it comes together in minutes. The wine makes it sharp, and the tarragon is a lovely complement to the shrimp (and would be equally tasty with chicken). Ravioli are a bit labor-intensive (not overly so if you start with wonton wraps), but you could create the same flavor effect with some penne or farfalle tossed with cooked shrimp and this cream sauce. It would be lovely served with asparagus or French green beans. I’ll do that soon too. But create your own ravioli sometime, it’s deliciously satisfying! 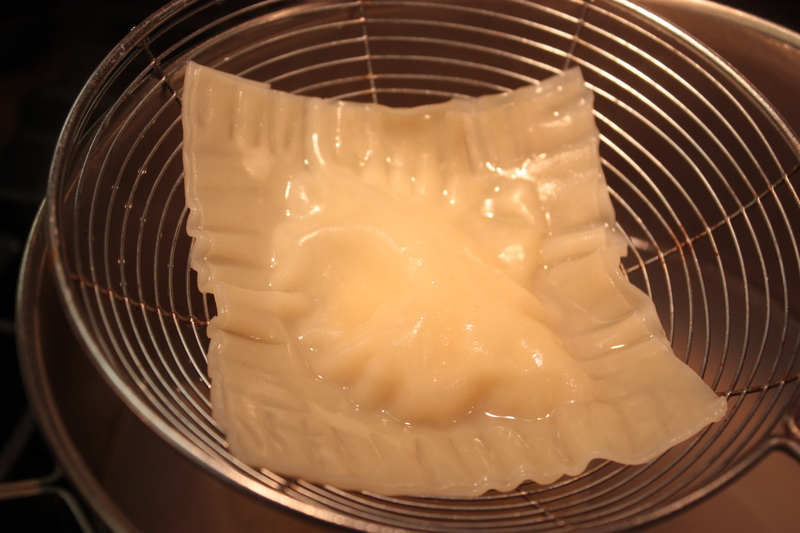 Oh, and wonton wrappers make giant ravioli–paired with a rich cream sauce, they are quite filling. 2-3 per person is plenty for a coursed meal of small plates (which is how I’ve been serving these lately). For a main dish, I’d probably do 6 per plate with a vegetable on the side. In a food processor, grind everything until it forms a sort of paste or mousse texture. Chill filling until ready to use. 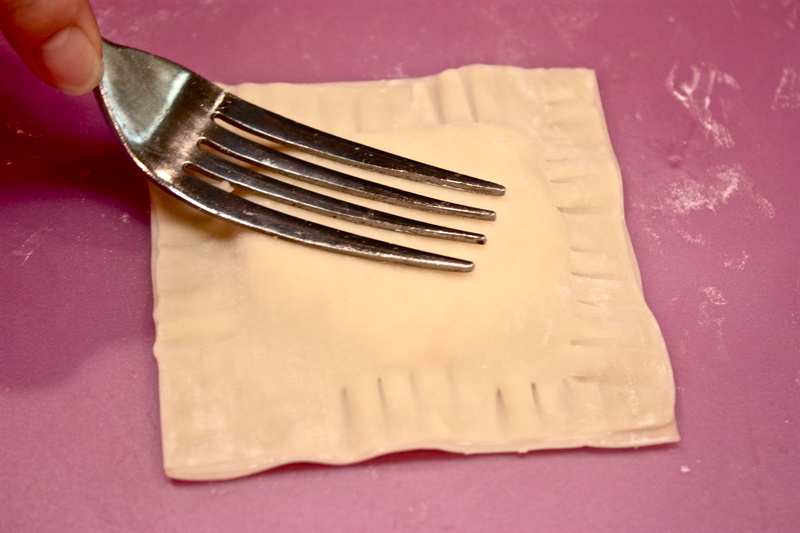 To fill ravioli, use a wet finger to moisten the four edges of one wonton wrap and spoon about 1 to 1 1/2 teaspoons of filling into the middle. Wet the edges of another wonton, then cover the filling and press the wet edges of the two wontons together, sealing all the edges well with your fingers. Press the tines of the fork along the edges to seal more tightly, then lightly press the back of the fork on the middle of your new ravioli to spread the filling out a bit inside (see photo at top). Be gentle! Bring a pot of water to a boil, then boil ravioli for 3-4 minutes. I found it best to cook only 4-5 at a time to avoid sticking together. 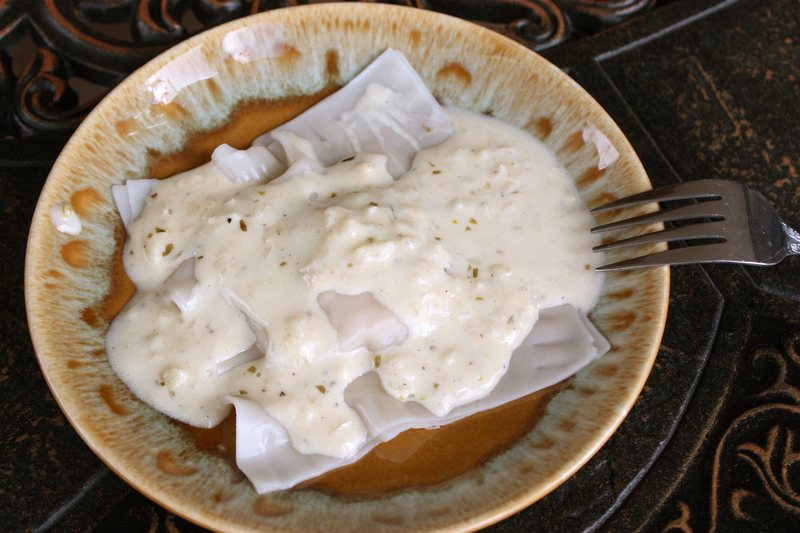 Drain raviolis with a slotted spoon or in a colander, top with cream sauce, and serve immediately. Sauté onions in oil and butter until translucent. Add garlic and sauté a few minutes more. Add wine and simmer another 2-3 minutes. Stir in cream and parmesan and bring sauce to a simmer. Add tarragon. Simmer for a few minutes, until sauce is thickened. Stir occasionally to avoid lumps and burning on the bottom of pan. Add salt and pepper to taste. Spoon over hot cooked ravioli. **I have made and shared this dish twice, once with raw shrimp for the filling, and once with precooked shrimp. The flavor was great both times, but the texture was nicer when I used the raw shrimp. Because it’s raw, when you boil the ravioli the filling cooks and stays together in one mass in the pasta. For me this gave it a better look when cut open and a nicer mouth feel. The filling made with precooked shrimp was tasty but felt sort of grainy in the mouth. This entry was posted in Savory and tagged Cooking, food, recipe, recipes, shrimp ravioli, tarragon cream sauce, wonton wrapper by needtotaste. Bookmark the permalink. 🙂 That is in fact what my mouth thought about this cream sauce! This sounds absolutely amazing. I only make ravis once a year at most. I’ll have to try this sauce! I’ve started experimenting with my own fresh-made pasta, and your tarragon sauce sounds like a devine way to gobble them up if I do all that work!